Just like the finest and most exquisite of creams, the Creme de la Creme rose is a White and Cream blossom that will truly present an air of sophistication and beauty to your next event. The Creme de la Creme Cream Roses have a slightly butter colored center and when completely bloom, its bulb takes on a beautiful star shape. They are perfect for white wedding as they can add a bit of color to the traditional all white festivity without deterring or disturbing the balance of the occasions theme. As a corsage adorning a ladies wrist is another perfect application for these wonderful florets. 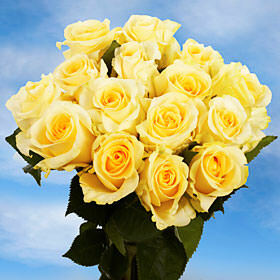 In a bouquet they can add a hint of smoothness and a very slight touch of color. 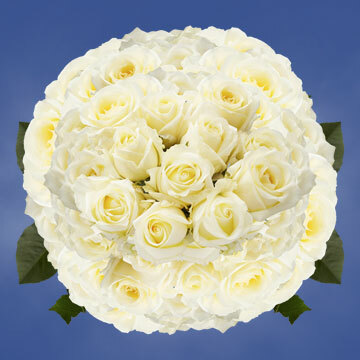 Cream Roses are a great consideration if all white blossoms would cause a bouquet to become bland. 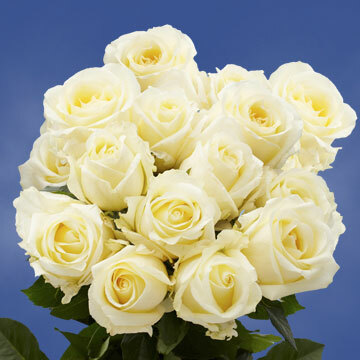 Here at Globalrose.com we use only the finest shipping available, that is why we exclusively ship all of flowers using FedEx. All of our products will arrive at your doorstep as fresh as Mother Nature intended them to be. Thanks to our state of the art greenhouses, we can insure not only superior freshness but also all year long activity. Our greenhouses are located in the world.s most prime locations which have fantastic weather all year round. When you are in need Globalrose will be waiting for your order.